Plantation on Marco Island is an immaculate property that envelopes its owners in continuous luxury. Built in 1991, it is located on 1000 South Collier Boulevard. The gated property offers 79 Gulf-view condo units on 10 floors. Each waterfront condo is elevator-accessible and range from 1,154 square feet to an impressive 3,844 spacious living. These residences come in 2BR or 3BR options with private balcony overlooking the beautiful Gulf of Mexico. The interior design is elegantly and uniquely designed. The amenities of Plantation include a heated pool, sauna, Jacuzzi, fitness center, fishing pier, grill and picnic area, covered parking, activity/social room, tennis, and elevator access. Beach access is only a few minutes drive away. Bike and walking trails are also nearby. The flourishing palm trees, colorful courtyard, and professionally kept grounds enhance and add beauty to the already gorgeous units as well as give a real sense and feel of being on a tropical island. 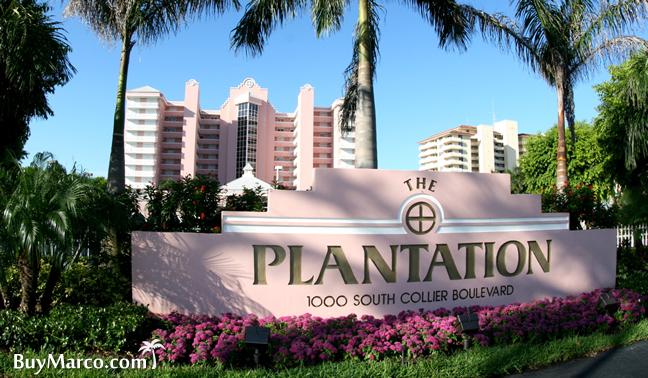 Plantation condos all have the same maintenance fee of $750, regardless of size. It includes all the usual stuff including wind and flood insurance. It also includes wifi service. As a percentage of condo value or price, Plantation fees are low. While no pets are allowed in the Plantation condos, many Marco Island condos allow pets. just check the Comparison Chart© above. Investors always want to know the minimum rental period so they can ascertain rental income potential. In Plantation, the minimum is 30 days, which is the most common policy on the island. There are four different floor plans in Plantation in 2BR and 3BR configurations. Plantation has a unique planform that maximizes the views of every unit in the building. Of course, the Gulf views are the most important, but bedrooms and dens may have island views, as well.. Click here to see all Plantation floor plans.